“Classical meets World- and Dance-Music” was a style more or less invented by, and for, the Kronos Quartet, and among the best pieces composed in that style were Terry Riley’s string quartets including Salome Dances for Peace and the quartets of South African Kevin Volans, but success breeds imitation, so after Kronos you got Balanescu, and after Balanescu you get The Smith Quartet, in a program of short dance pieces, many commissioned by them or written for them. 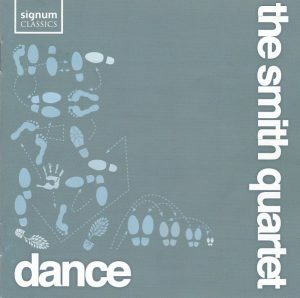 And this is indeed typically the kind of music you’d expect to hear from the Kronos and Balanescu Quartets: in turn nostalgic, songful, and dance-like in the opening “Dancing in the Spirit” by Tunde Jegede (1), and John Adams’ “Pavane: she’s so fine” from his Book of Alleged Dances (track 3) sounding more like that than like the customary orchestral Adams: sweet and pretty, stylistically backward-looking, but not too mawkishly sentimental either, just toeing tht dangerous border. Andrew Poppy’s “Definitely Disco” (track 5) sounds not so much disco than like your usual Nyman, e.g. repetitive, propulsive, boisterous and dance-like, which is not very distant from how Kevin Volans sounds in the first Dance from his first quartet “White Man Sleeps”(6), although there is more of South Africa and less of London it the dance of Volans, and there’s a robustness of scansion in the piece by Donnacha Dennehy (track 13) – including actual feet stamping at the end – that could make it a movement from a string quartet of Volans. 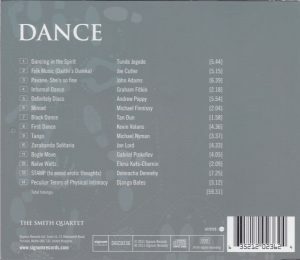 Django Bates’ jig-inspired piece (track 14) sounds like a romping jig for string quartet. And then Graham Fitkin (track 4) sounds like Michael Nyman when Nyman is in his lyrical and sentimental streak (which means that this is music that could have been composed in the first half of the 20th century by a none-too modernist English composer, tonal and melodic) – and Fitkin is really one simple theme repeated for a little over two minutes. And then Nyman’s Tango (9) sounds like Nyman at his most heart-on-sleeve lyrical, sentimental and film-musicking – and in fact, it was indeed written (in 2007) for the film “Never Forever” by Korean director Gina Kim, and Elena Kats-Chernin’s “Naïve Waltz” (12) sounds very much like a possible addition to the same soundtrack. But none is more mawkishly romantic and sentimental than Jon Lord’s Zarabanda Solitaria (track 10), with an incredibly corny underlying program, spelt out by the composer in the liner notes (“in an abandoned ballroom in a small town somewhere in the heart of Spain [do I read three clichés here already? ], a lone man, far advanced in years, but still proud of bearing [well of course – he’ Spanish, ain’t he? An ex-Toreador, no doubt], walks slowly onto the dusty dance floor. He stands for a while, gazing into his past [oh, no, sorry, a former Tango dancer. It certainly explains the “proud bearing” – that was before the lung cancer], then, with only a slight hesitation, he begins to dance…”). And it’s not because Jon Lord is the only composer among those featured here who’s dead that I’m sneering, it’s because he is the only one to have written such a corny program for such corny music. And then, the best pieces are those that don’t stay bound to their source but metabolize it into a fully contemporary language: Joe Cutler’s Folk Music (track 2), which goes beyond folk music (just as Riley and Volans go beyond World-Music in their string quartets) with its fascinating language, eerie harmonics, muffled pizzicatos, and still its moments of invigorating dance music. That’s “Classical meets World-Music” at its best. Gabriel Prokofiev (Sergei’s grandson, born and raised in England) also metabolizes his syncopated Reggae source in an authentically contemporary language, nervous, cocky, with many sound effects, not “pretty” but very dramatic – and still dance-like, as Grandpa Sergei and his colleague Dmitri Shostakovich were with their own sardonic and wild dances. Tan Dun’s piece (track 7) is the one that sounds most like “contemporary music”, and it comes as a welcome change, as Dun’s short piece is, as usual, wonderfully imaginative in its tougher exploration of sound. The liner notes offer good presentations of each piece by the composer’s themselves, but nothing on the composers themselves. TT 59:31. Not all the compositions here may be of the highest value, but as a whole they make for a very entertaining program, easy-listing but not stooping down too low either, and slotting perfectly between Kronos and Balanescu.